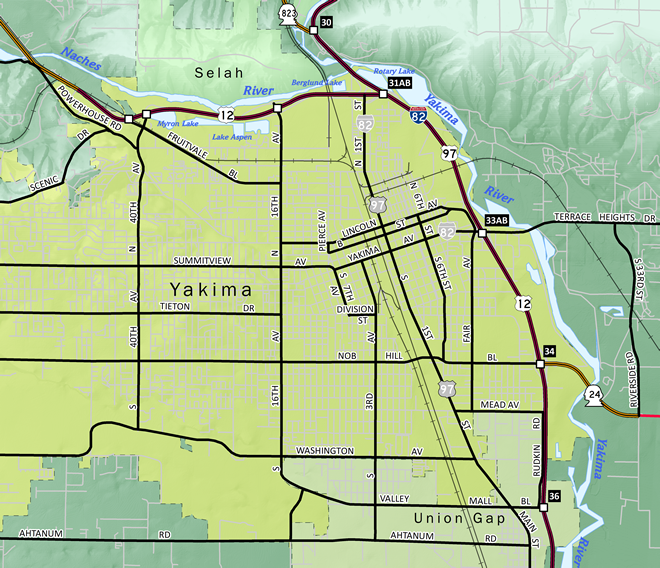 A look at some of the surface roads in the city of Yakima, Washington. Interstate 82 opened between Ellensburg and Yakima in 1971 and between Union Gap and Zillah by November 1981.1 The freeway replaced the routing of U.S. 97 northward to Interstate 90 and southward to Union Gap. U.S. 12 follows the freeway from Berglund eastward to the Tri-Cities and Interstate 182.
Business Loop I-82 was a short lived route joining the Yakima City Center with the freeway to the east. Signs for the route were posted until 1999, with one remaining as of 2016. Beginning at Exit 33 of Interstate 82, the loop followed Yakima Avenue west to North 6th Street and the one-way street couplet of East Lincoln Avenue (westbound) and East B Street (eastbound). The route turned northward along original U.S. 97 / North 1st Street for the return to Interstate 82 at Exit 31. Interstate 82 opened between Ellensburg and Yakima in 1971 and between Union Gap and Zillah in November 1981.1 The freeway replaced the routing of U.S. 97 northward to Interstate 90 and southward to Union Gap. U.S. 12 follows the freeway from Berglund eastward to the Tri-Cities and Interstate 182. U.S. 97 merges with Interstate 82 from Union Gap northward to Interstate 90 near Ellensburg. The highway consists of a four-lane divided highway southeast from the freeway split to Toppenish. U.S. 97 originally followed 1st Street through the Yakima City Center from Berglund to Union Gap. When Interstate 82 was completed through Yakima in 1971, the route shifted to the freeway in an overlap. The steel truss bridges over the Naches and Yakima Rivers for Interstate 82 are the original spans for U.S. 97 converted for use on the limited access highway. U.S. 97 joins Interstate 82 & U.S. 12 west via a wye interchangee beyond a loop ramp for Main Street (old U.S. 97) north. A freeway ramp connects Interstate 82 west directly with Main Street ahead of Wide Hollow Creek. From there northbound motorists pass under a freeway-style sign bridge hosting a welcome sign foro Union Gap. The assembly likely dates to when Interstate 82 was incomplete south of Union Gap. Photo taken 08/28/06. Yakima Ridge rises as the backdrop on the North 1st Street approach to U.S. 12 west and Interstate 82 & U.S. 97. A parclo interchange joins the former Business Loop I-82 and U.S. 97 with the U.S. 12 freeway. Photo taken 08/28/06. Wye interchanges connect North 1st Street (old U.S. 97) and the U.S. 12 freeway with adjacent Interstate 82 & U.S. 97. Interstate 82 links Yakima with Prosser and Richland to the southeast. Photo taken 08/28/06. A loop ramp joins U.S. 12 west as the route leaves Yakima for Naches Valley and the town of Naches. Washington 823 appears as the state route begins ahead and continues the original alignment of U.S. 97 into Selah. Photo taken 08/28/06. U.S. 12 provides one of six routes across the Cascade Range in the state of Washington. The US route splits with the former U.S. 410 at Upper Naches Valley for a path westward through Rimrock and White Pass to Interstate 5 near Napavine. Washington 410 follows a more northerly course through Chinook Pass and Greenwater to Enumclaw. Washington 823 constitutes a 5.62-mile loop from Twin Bridges and U.S. 12 northward through Selah to Washington 821 near Exit 26 of Interstate 82. Photo taken 08/28/06. Washington 823 follows a two-lane roadway between the east and westbound roadways of Interstate 82 & U.S. 97 across the Naches and Yakima Rivers to Selah Road. Drivers may use either the state route or the freeway north to Exit 26 for Selah. Photo taken 08/28/06. Business Loop Interstate 82 originally merged onto the left side of Interstate 82 west & U.S. 97 north ahead of the steel truss bridge over the Naches River. Interstate 82 & U.S. 97 share pavement to Interstate 90 near Ellensburg. Photo taken 08/28/06. North 1st Street continues south from a cloverleaf-interchange with U.S. 12 and the south end of Washington 823 to become a four-lane boulevard en route to the Yakima city center. A sign bridge welcomes motorists into the city from the days of the road as U.S. 97. Photo taken 08/28/06. The Yakima street grid consists of east-west alphabet streets from the U.S. 12 freeway southward to the city center. Pictured here is the approach to I Street. Photo taken 08/28/06. A railroad spur follows H Street east from the parallel BNSF Railroad line to an industrial site at North 7th Street. Several motels and fast food chains line the former U.S. 97 (North 1st Street) southward to the city center. Photo taken 08/28/06. D Street meets Main Street at the next southbound traffic light. Photo taken 08/28/06. Lincoln Way flows westward from Fair Avenue to North 6th Avenue. The one-way street was a part of Business Loop Interstate 82 between North 1st Street and North B Street until 1999. Photo taken 08/28/06. Business Loop Interstate 82 followed North 1st Street south from Exit 31 to B Street (Martin Luther King, Jr. Boulevard) east. The couplet of B and Lincoln carried the route to North 6th Street south to Yakima Avenue east on the return to Interstate 82. Photo taken 08/28/06. A Street travels one block west from North 1st Street to end at Front Street in downtown Yakima. Photo taken 08/28/06. One of Yakima's tallest structures, the A.E. Larson Building, was built in 1931 and stands 188 feet tall. The high rise resides at the corner of Yakima Avenue and South 2nd Street. Photo taken 08/28/06. Yakima Avenue comprises the main east-west route through the city center. The four-lane arterial joins 1st Street with Interstate 82 & U.S. 12-97 to the east via Terrace Heights Way. Photo taken 08/28/06. Chestnut Avenue mirrors A Street in function from Front Street east to Fair Avenue. Photo taken 08/28/06. Walnut Street crosses old U.S. 97 (South 1st Street) as a four-lane boulevard between South 6th Avenue and South 6th Street. Photo taken 08/28/06. South 1st Street expands into a conventional commercial arterial on the exit of downtown Yakima. Arlington Street and South 3rd Street meet the original U.S. 97 at this signalized intersection. Photo taken 08/28/06. Trailblazers posted for Interstate 82 and Washington 24 direct motorists from South 1st Street onto Nob Hill Boulevard east. Washington 24 begins at the diamond interchange with Interstate 82 & U.S. 12-97, 1.1 miles to the east. Photo taken 08/28/06. Nob Hill Boulevard stretches 5.6 miles west to South 80th Avenue through residential areas of west Yakima. Eastward the arterial becomes Washington 24 en route to Birchfield and Moxee. Photo taken 08/28/06. Mead Avenue lines the north end of an industrial area between South 1st Street and Rudkin Boulevard, the southbound side frontage road to Interstate 82. Photo taken 08/28/06. Washington Avenue meets South 1st Street at this traffic light near the retail heavy area centered by Valley Mall. Washington Avenue ventures west to Yakima Air Terminal - McAllister Field (YKM). Photo taken 08/28/06. Southbound drivers on old U.S. 97 enter the city limits of Union Gap at the intersection with Old Town Road. South 1st Street becomes Main Street at the city line. Photo taken 08/28/06. Passing by Valley Mall, Main Street (former U.S. 97) approaches Valley Mall Boulevard. The east-west arterial ends nearby at the Exit 36 diamond interchange of Interstate 82. Photo taken 08/28/06. The first sign alluding to U.S. 97 on the former alignment directs motorists southward on Main Street beyond Valley Mall Boulevard. Photo taken 08/28/06. Valley Mall Boulevard continues west from Main Street onto a 2009-completed extension to South 16th Avenue and Yakima Air Terminal. Photo taken 08/28/06. Main Street leaves the city of Union Gap at a wye interchange with a connector ramp to Interstate 82 & U.S. 12 east. Main Street otherwise spans a Washington Central Railroad line and merges with U.S. 97 en route to Parker. Photos taken 08/28/06. A 1941-built bridge retrofitted with metal guard rails spans a Washington Central Railroad beyond the ramp split to Interstate 82. Union Gap, the cut between Ahtanum Ridge and Rattlesnake Hills, lies in the background. Photo taken 08/28/06. A viaduct carries U.S. 97 away from Interstate 82 to Main Street at Union Gap. Photo taken 08/28/06. A second 1941-span crosses Ahtanum Creek ahead of the Main Street merge with U.S. 97. Southbound motorists enter Yakima Indian Reservation. Photo taken 08/28/06. A pair of freeway entrance signs herald the ramp onto U.S. 97.U.S. 97 technically is a freeway through Union Gap only because the steep hill side and parallel Yakima River prevent access points. Photo taken 08/28/06. Valley Mall Boulevard travels a short distance from Main Street (old U.S. 97) to Interstate 82. Photo taken 08/28/06. Interstate 82 travels south through Union Gap into Yakima Valley on the 70-mile drive to Richland (via Interstate 182). Photo taken 08/28/06. The Interstate 82 westbound control point switches from Yakima to Ellensburg on the sign attached to the freeway overpass. Interstate 82 travels north into Yakima on the 40-mile drive to Ellensburg (via Interstate 90). Photo taken 08/28/06. Valley Mall Boulevard ends at a park on the Yakima River adjacent to the diamond interchange with Interstate 82 & U.S. 12-97. Photo taken 08/28/06. Powerhouse Road travels along side U.S. 12 from Brace to Ramblers Park in south Naches Valley. The road represents a portion of the original alignment of U.S. 410. Pictured here is the intersection with the U.S. 12 divided highway and Old Naches Highway north to Lower Naches Grange. Photo taken 08/28/06. Yakima Avenue bisects downtown Yakima to Interstate 82 & U.S. 12-97 (Exit 33). The four-lane boulevard passes by the A.E. Larson Building and The Tower, in this scene beyond 1st Street (former U.S. 97). Photo taken 08/28/06. “2 more miles of I-82 opened.” Tri city Herald, October 15, 1981. “Group Asks U.S. 12 Change.” Ellensburg Daily Record, April 21, 1966. “410 Redesignated U.S. 12.” Tri city Herald, June 22, 1967. Page Updated September 23, 2011.